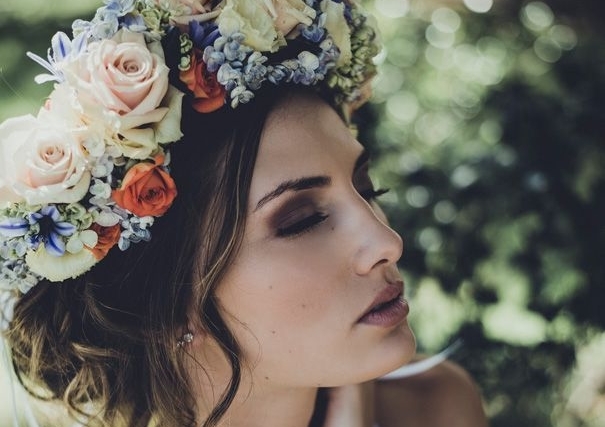 Flower Crowns are the epitome of elegance for your relaxed wedding day attire. Particularly appropriate for summer or island weddings, the flower crown is inexpensive, striking and can be tailored to exactly suit your wedding theme or 'feel'. If your wedding is over the top, brightly coloured and festive, a larger crown of peonies and roses could fit the bill while for a more reserved crown, draw inspiration from the Roman laurel wreath with greenery and delicate dustings of white with gypsophila for a resplendent crown to adorn your finished 'do. Below we've compiled a few crowns to suit some of the various popular themes at the moment. It all comes down to personal taste and which style will best suit the feel of your day. Remember that Harlow Garland's specialty florals department, HGBlooms can create these floral crown masterpieces especially for you, tailored to your signature style and taste with the greatest of ease. Talk to us today!